.. is a term we’re starting to hear very often, and perhaps too often too soon. I think it might cheapen and mis-direct the important process of making deep changes to the ‘colonization’ (due to the rampant corporatism of today) of the exchanges between people that are necessary to create almost anything that finds form and expression. But clearly it’s important (generally) as a widespread new way of creating things and services, and getting things done by and with people. The growth and spread of the term “co-creating” has led to significant interest in more open people processes, both in workplaces as well as other forms of organizations. And more and more processes both conceptual and practical in nature from the domains of art, theatre, ludic play, improv, circus, farce and pantomime are being drawn together and applied to why and how people interact and create. Participative processes like Open Space, World Cafes, Unconferences, Peer Circles and so on are beginning to appear in a range of hybrid forms wherever people are meeting and interacting to advance an interest, a topic or subject, a project, etc. At the same time, in the wide-ranging realms of art and culture-making activities we’re witnessing the advanced stage of a long-term wrestling match between commercial forces and the various main forms of funding the expression of creative endeavours. The explosions of creative technology we’ve been experiencing have spawned a series of sociological responses, in the form(s) of Barcamps, Wordcamps, Govcamps, Foo Camps, Unconferences, high-end celebrity-and-marketing-and venture-capital ‘experience’ markets, new cultural and artistic festivals with technology-and-culture-making themes. There’s also a rapidly-increasing range of maker faires, many and various configurations of online education (viz. the recent explosion of interest in MOOCs), community-and-consensus building, organizing for activism and fundraising, and other similar events and happenings. The impetus behind this explosion is both technological and sociological. Technological … There has been an historical evolution of various kinds of technology over the past three decades, but for the purposes of this essay we are referring to information technology and the creation and evolution of the Internet and the Web. When we speak of ‘co-creating”, most often we’re interested in the appearance, development and evolution of social tools, web services, massive storage, and the ongoing development of computer-and-smart-devices development. The changes have been massive and fast, and touch virtually all areas of human activity. And … it’s not going away. As Stowe Boyd has said, “welcome to the post-normal world”. Sociological … People are searching for ways to find others with similar interests and motivations so that they can engage in activities that help them learn, find work, grow capabilities and skills, and tackle vexing social and economic problems. As awareness spreads and experience grows, more and more of these types of events and purposeful gatherings occur. Thus, the “get informed and take action” aspects of general culture are strengthened and reinforced, leading to yet more of these types of activities. Developing familiarity and practice with open and collaborative processes are ways people can prepare for a messy and uncertain (post-normal) future. These processes invite us to play and work together. They occur in spaces in which people can 1) learn more about themselves and the courageous act of finding and using one’s voice, 2) show and see how useful and positive it is to expose and discuss various ideas, 3) demonstrate how effectively they can operate together in a small temporary community of ideas and energy about an issue. It can be seen as “practicing for the future”. The orientation to open and participative is now regularly taking form in the arenas of education, learning and organizational change. The processes outlined above, and others using the same principles, are cheap, easy for people to apply with a few simple rules about self-management, operate democratically, and produce results grounded in ownership and the responsibilities that have been agreed upon by the ‘community’. The relationships and flows of information can be transferred to online spaces and often benefit from wider connectivity. Today, our culture-making activities are well engaged in the early stages of cultural mutation. These processes are for these times. What’s coming along next ? “Smart” devices and Internet everywhere in our lives ? Deep(er) changes to the way things are conceived, carried out, managed and used ? New mental models ? Or, will we discover real societal limits to what can be done given the current framework of laws, institutions and established practices with which people are familiar and comfortable ? Shorter cycle-based development and release of software and web services incorporating the latest user- and-market feedback characterize our environment today. A philosophy known as Agile development and the related approach to Agile programming are having a rapidly-growing impact on how software applications, functionality and platforms are being developed. Focusing on the participation of users with respect to their needs and ways of using software is an important signal or development. It is clear evidence that the developmental and learning dynamics generated by continuous or regular feedback loops are becoming the norm in areas of activity in which change and short cycles of product development are constants. The Internet of Things (IoT) is a concept that has come to signify the implementation of intelligent sensors and software into objects that we find and use in daily life … clothes, homes, cars, buildings, roads, and a wide range of other objects that have a place in peoples’ daily life activities. This arena of concentration is experiencing major growth, equally in terms of hardware, software and with respect to the way the capabilities are configured and used. The implications for the uptake of the IoT and the sociological changes it fosters are being explored and examined in media and network culture research centres, universities and think tanks in many societies. The IoT concept is being combined with the new-ish concepts of Open Data and Big Data, and plays directly into the imagining of Smart Cities / Intelligent Cities. Many of the issues are known and understood, but carry the weight of necessary ethical, political and social impact policy decisions with regard to the presence of intelligent-and-connected objects and activities in our daily modern urban life. The implications go beyond the tools and the political and economic effects of their use. Rob van Kranenburg, the author of “The Internet of Things” and colleague Christian Nold, recently published a document in which they discuss the future implications and ramifications of deploying the IoT. The new document is titled “The Internet of People for a Post-Oil World”. This document makes clear that key opportunities associated with widespread uptake of the IoT are derived from the impact upon peoples’ activities and lives. It is expected that the proliferation of the IoT will introduce significant challenges, particularly with respect to dissembling the dominant mental model of commercializing the use of technologies and consumption of products and services generated thereby. Therefore, they posit, we had better involve people in asking the appropriate questions about why, what, how, when and to do what with the IoT. Issue for people everywhere: reclaim a politics of technology that is based on the struggle over the terms of their own participation. Needed: a public debate and tangible design interventions that challenge the need for commercial tools. People from all walks of life have to be at the table when we talk about alternate uses of ubiquitous computing. We suggest an IoT as a non-commercial refuge … as an umbrella of emerging technologies that do not only serve capital but also facilitate grassroots survival networks in a world faced with ecological and social devastation. Whether or not these emergent issues become partly or fully commercialized, or whether they remain mainly in the domain of unfunded or grass-roots initiatives, it’s increasingly clear ‘we’ are on our way towards more integrated eco-systems of issues, people and technologies. And in these new sets of conditions, participation and inclusion enabled by interconnectedness are quickly becoming the ‘new rules’. you’ll need to ask the mouse. Assessing and forecasting possible futures has become a legitimate domain of research and exploration over the past two or three decades. One of the powerful tools used in this domain is the ‘scenario planning’ approach, wherein alternative scenarios (usually three or four) are created based on looking at possible extrapolations and evolution of the current and emergent elements of our world’s politics, economics, anthropology, technology, psychology, sociology and philosophy. Research observations, anecdotes and examples are combined with data to develop responses in a scenario format about a question or issue seen as important to our collective future. The responses are then crafted into the form of a narrative scenario which can be read, digested and explored. One of the best-known expositions of the method and its uses is available in the 1996 book “The Art of the Long View” by Peter Schwarz, a senior member of the renowned Royal Dutch Shell Strategic Planning Group. 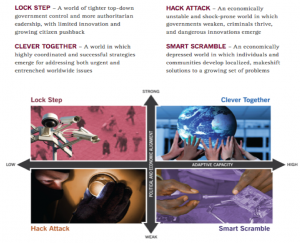 A scenario planning exercise carried out by the Rockefeller Foundation looked at the possible futures for an interconnected world. The issues we face were assessed on the axes of Adaptive Capacity (low to high) and Political and Economic Alignment (weak to strong). The descriptions of the four possible scenarios shows us quickly how many of these elements are already in play. And of course, our collective future is likely to become some blend of these four scenarios as the components play themselves out in an increasingly complex world. Clearly these early (and now not-so-weak) signals and patterns tell us that the core assumptions and principles that have underpinned organized human activities for most of the past century – the full bloom of the industrial era – are being changed by the combinations and permutations of new, powerful, inexpensive and widely accessible information-processing technologies. For a couple of decades now we’ve been being told by future-seekers, philosophers and technological and social innovators that we will henceforth be living, working, playing and co-creating our future at the brave new frontier offered by the information-saturated ‘wired world’. The short description of each scenario reinforces the perception that we are both individually and collectively in transition from a linear, specialized, efficiency-driven paradigm towards a paradigm based on continuous feedback loops and principles of participation, both large and small in scope. Whether we will shape this into an harmonious and effective new paradigm or some relative degree(s) of dystopia remains to be seen. As noted earlier, these are all early signs of cultural ‘mutation’ that are already with us. The concept of wirearchy (other terms also have been used to describe the elements and dynamics of emergent network principles and guidelines) has been applied to offer insight into the manifest implications of this new environment. Today, more and more people confirm seeing these principles in action in a range of important ways. a dynamic two-way flow of power and authority based on knowledge, trust, credibility and a focus on results, enabled by interconnected people and technology. 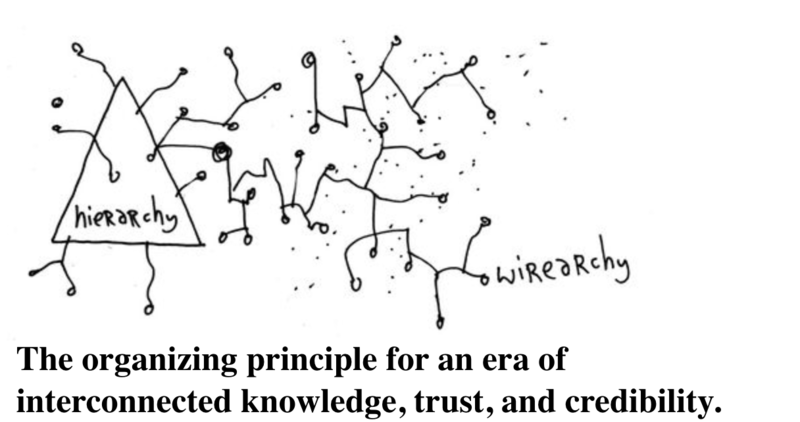 More and more of the emergent activities associated with communities of people and interest coming together to engage around a problem, issue or opportunity contain the elements of wirearchy (knowledge, trust, credibility and a focus on results) at the core of the initiative. Prominent examples include the role of social media and smart mobile devices in the uprisings in Egypt, Libya and elsewhere in the Middle East, or the shocks to our traditional power structures administered by the appearance on the scene of Wikileaks, with its bias towards transparency that menaces established government dynamics. Alvin Toffler foresaw much of this in the 1990 book “PowerShift – knowledge, wealth and violence at the edge of the 21st Century” .. today this shift is indeed underway. Where will the shift will take us is an interesting (and still open) question. To underpin and support that transition, it is becoming more and more useful to look at the utility of the principles of a domain that began emerging in the 1950’s and 60’s, in the early stages of the growth and development of what we know today as our modern society. The roots of organizational development (OD) are in humanistic psychology and sociology action and ethnographic and cybernetic/ socio-technical systems theory. It’s a domain that emerged essentially as a counter-balance to the mechanistic and machine-metaphor-based core assumptions about the organized activities in our society. Using these humanist principles of organizational development, leading organizational complexity theorists have in recent years created models that help clarify how to evaluate and respond to the continuous turbulence and ambiguity generated by participating in interconnected flows of information. To date we have by and large existed and responded to conditions and contexts characterized by either Simple, Complicated or Chaotic dynamics (from complexity theory fundamentals). Increasingly, Complexity is emerging as a key definer of the issues, problems and opportunities faced by our societies. 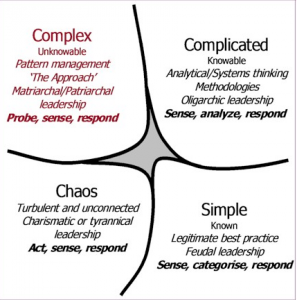 Dave Snowden, founder of the IBM Centre for Organizational Complexity, has over the past decade created and refined the Cynefin model for assessing and responding to these new challenges. It offers a well-synthesized and coherent framework for evaluating issues and conditions and then making decisions and taking appropriate action(s). Much of today’s co-creative activities must and probably will find ways to come into being. Indeed, a growing practical response to these various conditions (above) can be seen more and more frequently. Arguably, Occupy Wall Street was an early attempt to bring some global coherence to the power of peer-to-peer connection and conviction in the face of oppressive oligarchy / plutocracy. Another useful example is offered by burgeoning peer-to-peer movement(s) unfolding around the world. The dynamics of co-creation are deeply embedded (if not foundational) to P2P activities. The proliferation of cultural festivals and events and happenings at salons, forums, galleries and other venues reflect participative responses to many of the challenges emerging from our growing societal complexity. These events and happenings are where people gather to view, wonder, communicate and explore the infinite ways art and culture stimulate reflection, attraction and the opening of minds and hearts. This is all occurring at a time when it also seems people everywhere are seeing and feeling the loss of parts of their lives to the ‘enclosure’ of privatization and the diminishment of the commons (the public spaces where certain types of common services and goods are made available to the public). Co-creating in a wide range of forms, processes and purpose may become an effective and important antidote to the spreading enclosure of human creative activity. But .. the dominant models of governance, commercial ownership and the use and re-use of that which is co-created by people are going to have to undergo much more deep change in order to disrupt the existing paradigm of proprietary commercial creation and the model of socio-economic power that this paradigm enables and carries today. Very well done, Jon. One of the things that intrigues me is how little of this, at the end of the day, needs the “wire” (or the “wireless”) that first triggered the Wirearchy concept. Simple methods of discussion, leaderless emergence of consensus, and a tolerance of ambiguity and not knowing the outcome in advance carries most of the load. Occupy, in turn, demonstrated just how this could mobilize many, in many locales — it wasn’t limited to just line-of-sight or a Dunbar’s Number of participants. Much to think about here, and for this, I thank you. You got it, Bruce ! Yeah .. as we’ve discussed before, the dynamics to which I made reference are ‘coming” and growing, like deep ocean currents. It’s not about “wired” and/or “wireless”, it’s about deepening, broadening, making relevant (and more powerful) the individual and group interactions and exchanges that are bottom-up, lateral and top-down. You make important connections between many significant threads, and even your asides would allow for lengthy discussion. But I’m mostly thinking about playfulness, in this context. As a kind of disclaimer, I performed a little something about this at Ignite Montreal, a few years back. Where our ideas seem to connect most clearly, to me, is in the move from game to play, which I (playfully) describe as a move from Protestant Work Ethic to Catholic Play Ethic. Some game scholars would readily disagree, but games are (in my view) goal-oriented and hierarchical. I say play as open-ended and relational. Though play can lead to performance, much of it is in the mode of rehearsal, even less directed than “trial-and-error”. During that same Ignite, Elisabeth Bucci presented “A Thing about Pyramids”, on the tendency for hierarchical organization. I’d argue playfulness gets closer to wirearchy, in some sense. Especially if we add a dose of Bruno Latour’s view of the network as being “less than the sum of the parts”. I’m sure we’ll have occasions to discuss this and several other things, including constructivist MOOCs, Art of Hosting, the limits of “co-design”, technological appropriation, culture jamming, and what I call the “Social Butterfly Effect”. Thanks, Alex, for the cogent comment. Yes, we have a lot to talk about. IMO you are right. The introduction and use of ludic concepts and dynamics is critical for ‘effectiveness’ as our individual and collective future unfolds. Great article Jon. I am a practitioner of p2p applied to economics (innovation, production, and distribution) and convinced that co-creation is the way forward for our society. I am not expressing my belief in an ideology or my preferences. I would say that co-creation is the inevitable way to go, as large scale co-creation processes are superior to classical processes, economically speaking. From my experience, co-creation is still in its infancy. We still don’t have the tools to allow it express its full potential. So there is some serious infrastructure work to be done. We’ve been mapping it for more than four years now. Another problem is cultural, or what you call “mental models”. Co-creation requires people to do things in a very different way. We are trying to formulate solutions to these shortcomings with our SENSORICA community (see link associated with this post). Great article ! I wish I had written it. I believe creativity has an intrinsic generative/healing quality and co-creation is disrupting the way we work and live together. I have been studying and documenting how various communities use co-creative gatherings and from the data I build a ressource listing various documented formats to inspire others in their co-creative endeavours. You might find it interesting. Nice article. I fully agree with it. I like the “Participative Work Design”, though I feel like a blindspot: for now, there are people that know how to evolve in such participatory processes and build something out of it. Yet, not all are attracted to them, lest know how to behave so as to make the experience fulfilling, if not thriving. It relate to point 4 I guess: “Mutual support and respect – reciprocating, giving and getting help”. I think we need to somehow teach people how to do that. That’s what we tried with our open-source facilitation techniques dubbed “Labso” (Laboratory for Social Technologies): we teach people how to identify their own strengths, amplify them and then refract them onto the world by way of their social network (how to bond so as to make the whole more than its parts). You can check out at http://www.labso.org/. Volunteers welcomed to hack and improve the ideas!